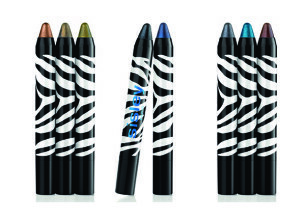 Phyto-Eye Twist is an all-in-one eye make-up solution: eye shadow + eyeliner. The “jumbo” tip blends and glides to colour the eyelids, easily applying graphic make-up or drawing an XXL line. The skincare formula is enriched with plant-based active ingredients (green tea, white lily, camellia) and protects the delicate skin of the eyelids. The gliding, ultra-sensory, waterproof texture allows an ultra-easy application and a flawless hold all day long. Its magnetic shades enhance your look in a single twist and offer a multitude of finishes. Fun and practical, there is no need to sharpen this new zebra-look jumbo pencil. What an incredible make-up product – this jumbo eye pencil draws on like a dream, and what’s more, the colour stays on for hours. I’ve been using the dark blue one, and I love the way it lights up my brown eyes. It’s extremely gentle on my eyes and I really appreciate how effortless it is. It draws on in just one stroke, and you can even use it as an eyeshadow across your entire eyelid. The packaging is so cute too – I love the zebra stripes!